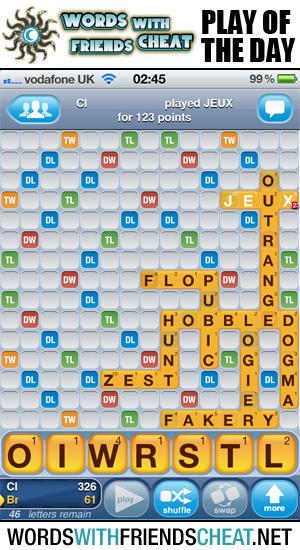 Do you want to be the Words With Friends Cheat – Play Of The Day? Submit your high score screenshot now: [email protected]. We choose the best play every single day and post it to the Words With Friends Cheat site, Facebook, Google+, Pinterest and Twitter. Think you’ve got what it takes? Made better plays than what you’ve seen posted already? Don’t just talk, send us your screenshot and put your wordplays where your mouth is! Here are all the words (and their point values). rubicund for 107 points – crazy! I got 168 points for exhibit. How do I sent the screen shot? You “came across” this site? While doing a Google search for Words With Friends Cheat. Nice. Pot. Kettle. Black. Pwned. how di I get a screenshot of my game to post to you? Just played MUSKIER – the S was in the perfect position after my opponent set me up. Total of 123 points – one of my best plays in months. I played the word “fazenda” for 195 points.